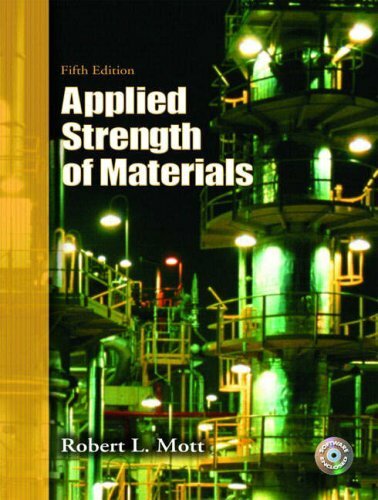 This book provides comprehensive coverage of the key topics in strength of materials–with an emphasis on applications, problem solving, and design of structural members, mechanical devices and systems. It includes coverage of the latest tools, trends and analysis techniques, and makes great use of example problems. Chapter topics include basic concepts. design properties of materials. design of members under direct stress. axial deformation and thermal stresses. torsional shear stress and torsional deformation. shearing forces and bending moments in beams. centroids and moments of inertia of areas. stress due to bending. shearing stresses in beams. special cases of combined stresses. the general case of combined stress and Mohr's circle. beam deflections. statically indeterminate beams. columns. and pressure vessels. For practicing mechanical designers and engineers.